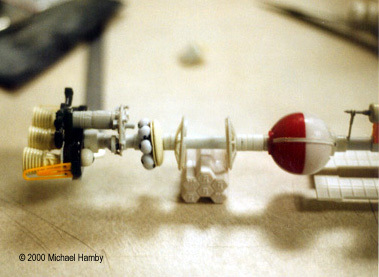 Editor's Note: This is a bit different than our usual article, in that there is no information on how the model was built. Michael built this for our "Mind's Eye" contest, and submitted an original story-line along with the photos. While it fell outside the rules of the contest, I knew there was a place for it on the site. It's inspired me to let my imagination go - I hope it does for you too. - J.L. ^ Here's where the habitat section came from. ^ Engines, before and after. 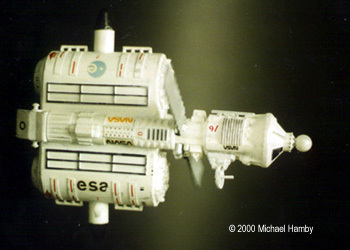 This space vessel was built as a combined effort of industry and various world governments to finally get man into serious exploration of our solar system. It has a twelve man crew, comprised of scientists, doctors and engineers, as well as the latest in on board computer technology. The duration of their first exploratory journey will depend on equipment and personnel endurance and performance, though a minimum mission duration of of 5 years is envisioned. So far they have been out for 11 months and all is going very well; crew confidence and morale are high. The ship is a culmination of 5 years of work, research and co-operation between various governments and industrial giants. With various scientific and sensor packages making incredible mineralogical and scientific discoveries, it's expected that financial incentives will spur the building of more of these kind of vessels. The ship is 855 feet long and weighs 389 metric tons. The on board electrical system generates 78 megawatts at full power. The propulsion plant is capable of generating 200,000 lbs. of thrust at continuous output (if required) until complete fuel depletion. The plant is a modified S5G nuclear reactor, a joint construction between the US Navy and the Russian space program's "Space Reactors Research Group". It uses the thermal energy developed by the reactor to heat and pressurize liquid mercury to a vaporous state, which is expelled out the rear of the craft at very high velocity. Magnetic fields are used to control velocity and direction. 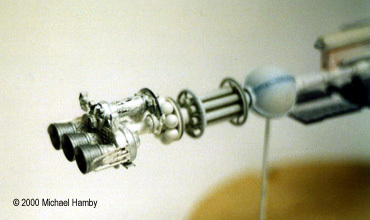 The liquid mercury, as well as other chemicals and water, is carried in storage tanks near the end of the long support boom that is the "spine" of the space craft. Their position, just forward of the reactor, helps shield the habitat section from excess radiation. So does the physical distance between the habitat and the power plant. The reactor is out in the open to help dissipate excess thermal energy into the vacuum of space. 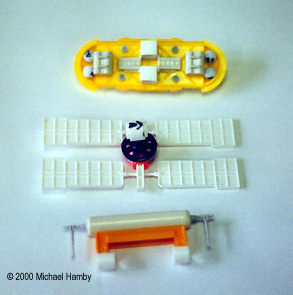 There are extensive solar panel arrays both fore and aft, to be used in emergencies and as an auxiliary power source if needed. 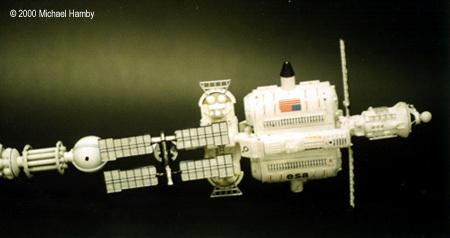 The panel arrays are not much use right now, since the space craft is beyond Mars surveying the asteroid belt, but they are kept online at minimum output to maintain a trickle charge to the ship's main battery banks. Just aft of the habitat section is the science and experiment platform. Various instruments and science packages are hard mounted on this platform for ease of access. And because of the location, the deployable packages, probes and buoys are mounted in their launchers here. The habitat section at the bow of the ship is a marvel of simplistic design and redundancy. It was the section that took the longest to build as well. It had to be reliable, with redundant built-in systems as well as state of the art electronics and life support systems. The entire crew calls this part of the ship home. Each person's likes and lifestyles were taken in to account when their individual living quarters were built. The section incorporates natural hydroponics, as well as bacta-tanks, and atmospheric, solid waste, food and air recycling using natural and chemical filtration systems. If the rest of the ship were destroyed, the crew could survive comfortably for a very long time - long enough for help to arrive. This section can also separate from the aft drive section in case of a reactor accident. It has its own propulsion system: a low power, constant thrust ion drive plate system. There are also two escape pods located on the habitat section, each big enough for six crew members. 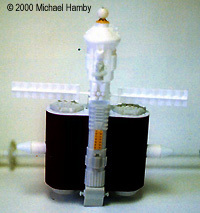 These pods are equipped with ablative heat shields to be used for atmospheric entry if in Earth orbit. The command and control section was thought by some to be a waste of time and money when built. 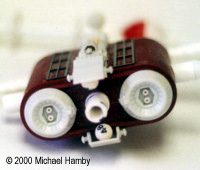 All of the ship's systems are computer-controlled, autonomous and operating automatically. The ship could run itself, if need be. But to provide the crew a feeling of self-control, and emergency backup, the crew operates the ship's guidance, navigation and control protocols. Crewmen stand a modified six hour on, 18 off, rotating watch, during which they monitor and adjust ship's systems as needed, conduct routine maintenance and other regular activities. After watch, their time is spent as they please. Finally, after all our struggle and effort, it looks like there is a brighter future for man and his need to explore and see what's beyond the horizon. 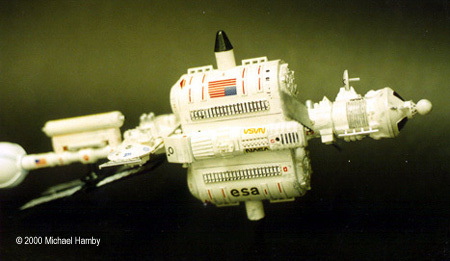 This page copyright © 2001 Starship Modeler. Last updated on 5 January 2001.